This DVD is designed to assist students studying for Signature Level 2 Certificate in Irish Sign Language (ISL), in the development of their receptive skills and understanding of ISL features. 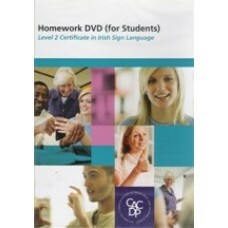 This DVD is introduced and presented by a Deaf person. It contains 15 stories presented at a level and speed appropriate for Level 2 students. After each story is presented, the student is asked several questions. Students should note down their answers. The story is then repeated with the answers to the questions. The story is then repeated again with a description of the ISL features used in the presentation of the story.